AKO offers the most diverse range of Pinch Valves for Food, Chemical, Mineral, Abrasive and Pharmaceutical applications. 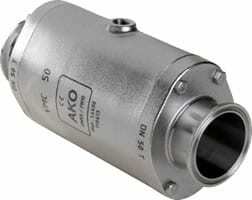 AKO air operated Pinch Valves or Hose Valves are the ideal solution to shut-off and convey powders, pellets and suspensions. For any pinch valve application, whether it be on-off dispensing, tanker filling, controlling the flow of product with a proportional regulated valve, a mixing process, bagging machines, vacuum lines or spraying, AKO pinch valves are proven to be the succeeding product in many industries. Line Pinch Valves for pneumatic conveying of bulk materials such as cement, sand and gravel are commonly supplied into the building and construction industry.